* Guides students in the preparation of literature reviews for term projects, theses, and dissertations. * Most chapters are conveniently divided into easy-to-follow guidelines, sequential steps, or checklists. Numerous examples throughout the book show students what should and should not be done when writing reviews. * Emphasizes critical analysis of reports of empirical research in academic journals--making it ideal as a supplement for research methods courses. This book makes it possible for students to work independently on a critical literature review as a term project. * Nine model literature reviews at the end of the book provide the stimulus for homework assignments and classroom discussions. * The activities at the end of each chapter keep students moving toward their goal of writing a polished, professional review of academic literature. * Most examples include material from recently published research. 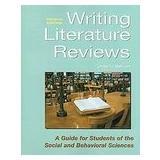 Includes nine model literature reviews for discussion and evaluation.